Dry Loop DSL. I have Earthlink DSL but Verizon maintains there lines and they put in an external box (on the side of the house) for the Dry Loop DSL. The box contains modules one of which is connected the wiring inside the house. That module says "no electronics." I'm just wondering if anybody knows that this means and whether it might be affecting the quality of my Ooma calls--which are characterized by frequent burst of static throughout the call. Anybody know whether or not this is the appropriate or inappropriate module? Don't know if this is an appropriate module, but maybe you could try connecting a phone directly to the hub (disconnecting any other wiring to other phones) and try some calls that way and see if you still get static. If you don't, it is a fair assumption the DSL is creating that problem. The "no electronics" on the bridge module is an FYI for the technician working on the box that there is nothing of electronic significance in the module. The other module looks to be a Tii POTS/DSL splitter. They install them when you are using telephone/DSL on the same line. If they installed the Dry Loop DSL correctly, you should be on a separate physical line. Most likely the static you are experiencing is from the phone line that is no longer being used. 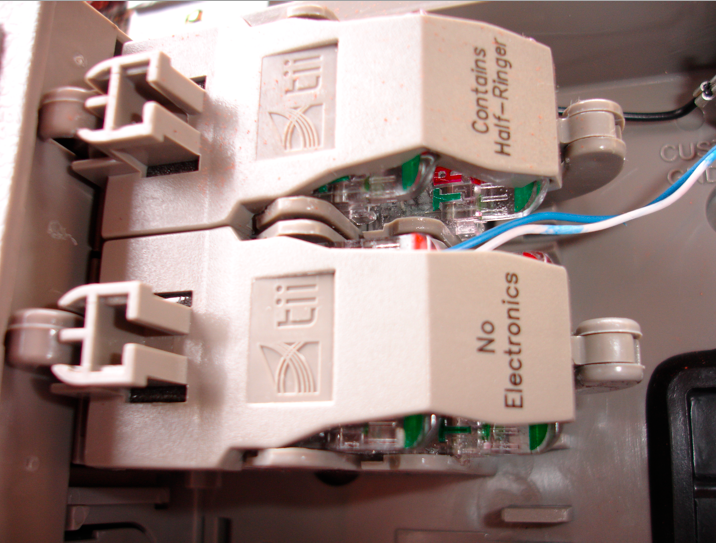 Stray voltage and line noise are common on phone lines and can interfere with DSL performance. Go outside to your NID and disconnect the phone line that you are no longer using and leave the DSL line connected. See if this eliminated the static issue. If you are still experiencing static, then it could be your inside wiring. In that case, try another set of wires outside for your DSL connection and use the same color wires on the inside jack to the hub. Here is the link to Tii that makes the components installed in your NID. Check the product number on the side of the installed module and open the .pdf to read more about the module and installation diagrams.